As a member of WWF and a conservation ambassador, I believe I hold a unique view I’m obligated to share. I am not from Wyoming, but I am Wyoming. I believe in the right to free clean vast open spaces. I believe in land that’s just as much mine as it is yours. I believe it is my duty to fly fish along the Platte, call to ducks over the wetlands, and chase the flutter of sage grouse wings along this beautiful landscape. I have these thoughts and urges because I am more than a hunter, I am a conservationist. As a conservationist, I believe it is also my duty to fight for these open spaces. I come from a land of flat landscapes, rolling suburbs, and busy streets. I come from a place where BLM means an entirely different thing. Federal lands don’t exist there. A system called a “check-in” is mandatory on many “public lands” and few public hunting areas that do exist. Imagine having to tell someone every time before you go out to chase one of the very limited game species. There is no backcountry in this place. While Illinois will always hold a special place for me, the State and its hunters could have used an advocate like WWF years ago to protect what matters. As I’ve lived here over the past few years I’ve come to tell my story to few people. My urge to chase feathers has pushed me all over the west and it’s a passion I seldom find in other bird hunters. I hope that my fellow hunters will attend this event and take this passion we share and use it to fuel the ever-growing and important conservation machine. I may chase sage grouse with my Weimaraner across rolling sagebrush flats, but without someone to be the voice for the birds, I wonder how much longer I will have this privilege. 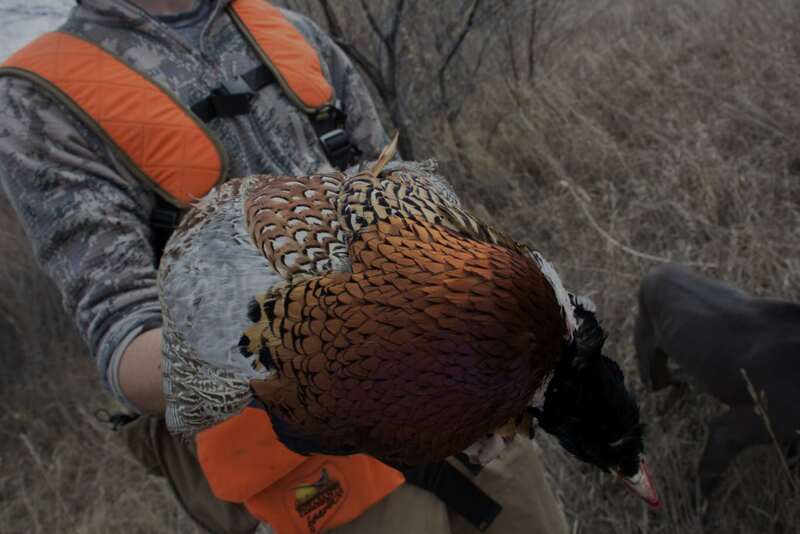 This event is designed to get bird hunters, who are often left voiceless, to plug in. I am organizing this event in partnership with WWF as a chance for us to get together and share our experiences. Entry to this event is going to be $40 a head and comes with a free cup, a beer, a ticket to the films and to our esteemed speakers and free access to our wild game cook-off. The cook-off features teams of some travelers and some of our local game meat connoisseurs like Maven, The Middle Fork, and Hunt To Eat. Following our food service, you can sit and enjoy our cadre of excellent speakers retelling their passion through their stories. Ron Boehme of the hunting dog podcast will be our headliner and the all-star cast includes Holly Heyser, Ed Arnett, Nick Larson, and Lander’s own Kirk Billings. 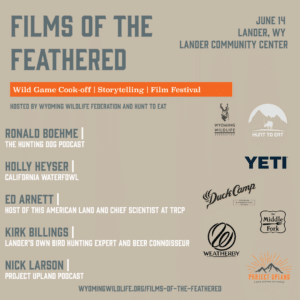 To wrap up the evening of bird brains we will be showcasing some excellent bird hunting films from groups such as Yeti, Duck Camp, Artemis, and Project Upland with some unreleased films. We’ll be having some killer raffles including but not limited to, two Weatherby shotguns, and items from Duck Camp, First Lite, Sitka, Gun Dog Supply and OnX. From 4:30 – 9:30 you can expect an unforgettable night for the bird hunters, dogs, and conservationist. All proceeds from this event will go directly to WWF’s work with Sage Grouse and habitat. I ask that any of my fellow feather enthusiasts come to join us to make a difference and at the end of the night, be a voice in what we all hold dear. See you there.